After a decorated career at Longmeadow, which included an undefeated D2 state championship run, long pole Dan Cotnoir hopes to bring an NCAA D2 national championship to Merrimack. But the former Lancer is just one of many Massachusetts products hoping to lead the Warriors to victory in their home state. Photo courtesy of Merrimack Athletics. Foxborough, Mass. - Sports are cruel. 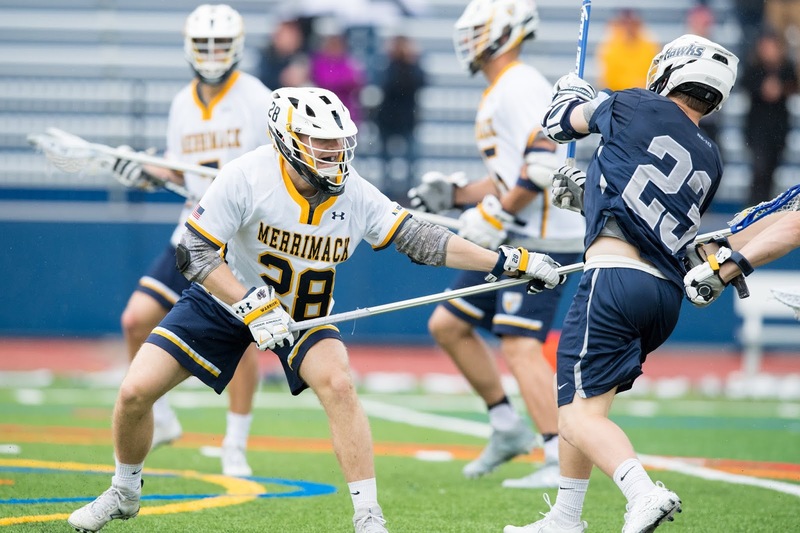 Last year, the Merrimack men’s lacrosse team advanced to its first NCAA Division II title game, and had the lucky draw of playing in the Commonwealth at Gillette Stadium. The Warriors let a lead slip away late and lost to Limestone. This year, though, the Warriors are back in the title game, and return to Foxboro better than ever with a team getting contributions up and down the lineup from Bay State natives. Merrimack's second consecutive title game in Massachusetts will take place Sunday at 4 pm against No. 6 St. Leo. Thanks to the wealth of local talent, coach Mike Morgan believes his group is capable of leaving Gillette Stadium victorious this season. As for the locals, no one has been better than Christian Thomas. The freshman from Wrentham is third on the team with 70 points and is tied for the team lead in the NCAA tournament with 12. He also does his part in keeping possessions alive with 12 ground balls on the season. Thomas is one of seven players with 20 or more points for the Warriors this season. Right alongside Christian is his older brother Dom. A sophomore, Dom has 23 points and 14 ground balls this year. He also has put 77.1 percent of his shots this season on goal. The duo starred at New Hampton Prep in New Hampshire, and led the Huskies to multiple Lakes Region Conference championships. Dom spurned Boston University, Siena and Drexel to come to Merrimack. Christian was the captain of the lacrosse and soccer teams as a senior. The Thomas brothers are clearly relishing the opportunity to play together once again. Along with the Thomas brothers is a duo of longpoles from Western Mass power Longmeadow who have anchored for the Warrior defense. Junior Dan Cotnoir has started every game this season for the Warriors. His experience has helped the Warriors hold opponents to 7.4 goals a game. His 15 caused turnovers are second on the team. Alongside him is Carlin Joyal. A freshman, Joyal has played in every game this year and had 25 ground balls to his name. He’s also jumped into the offense from time to time and has two assists this season. Both shined at Longmeadow. As a sophomore Cotnoir was part of an undefeated 25-0 state championship team, and Joyal won a pair of Central/West sectional titles as a Lancer. Both were also captains of the team as seniors. Mike O’Connell also knows a thing or two about championships. The Sudbury native won a state title at Lincoln-Sudbury in 2015, and has been a cog in the offense for Merrimack his whole career. With 78 points and 51 ground balls in his three years at Merrimack, O’Connell has been a consistent presence on the offensive end for the Warriors. This year he has 20 goals and five assists. Seven of those goals have come in the NCAA tournament. O’Connell is also shooting a career-high 58.8 percent from the field this season. O’Connell said that playing at an elite high school program like L-S helped get him ready for the high-level needed to succeed at Merrimack. Like O’Connell, Dean Prouty knows what it takes to succeed at a high level. Prouty was a star at Hanover High and helped lead the Indians to two state semifinals. With 40 points over his career, Prouty has been a solid role player for the Warriors in his four years in the program. Prouty said that last year taught the team a lot and has kept them motivated in 2018.